Ethiopia Christians on Sunday celebrated ‘Demera’, which is a ceremony of the Meskel – finding of the true cross, observed by torching a big bonfire. Meskel, is the spiritual holiday of Orthodox Christians in Ethiopia and has been celebrated for thousands of years. It has now been designated by UNESCO on the Representative List of the Intangible Cultural Heritages of Humanity. The feast commemorates the discovery of the true cross upon which Jesus Christ was crucified, by the Empress Helena, the mother of Constantine the Great. The inscription could enhance the visibility of intangible cultural heritage and promote inter-cultural dialogue among the multi-ethnic population of Ethiopia as well as other communities internationally. According to legend, Helena gave pieces of the cross to all Orthodox churches, including the Ethiopian Orthodox Tewahido Church. The Ethiopian Church therefore claims to have its own piece in Gishan Mariam monastery, hidden from the public view, north of the capital, Addis Ababa. Followers of the Ethiopian Orthodox Church observe the Meskel evey year, which last for two days, by building and burning a big bonfire, known as Demera. 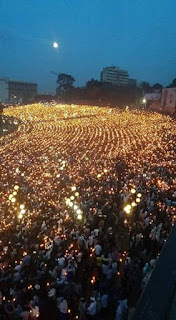 In the capital Addis Ababa, followers attend Demera, the eve of the main holiday (Meskel) at the city’s main square where the large bonfire is torched by the Patriarch. The practice is said to have originated in the fourth century with St. Helena. Following a vision that came to her in a dream, St. Helena created a huge fire, infused with frankincense and let the smoke guide her to remnants of the cross on which Jesus Christ was crucified.